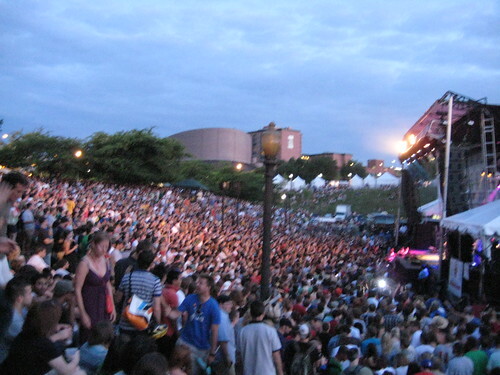 Though I was just a spectator at Artscape 2009, these two photos explain part of why I like working shows. I get to see the before, during, and after phases. I didn’t stick around for the after, nor did I make much of an attempt to sit closer. The hill was pretty packed and according to some friends — who did press forward, to the tune of 20-30 minutes — it wasn’t worth the effort. There’s a brief video panning across the stage left side during Cake’s set, which shows about half of the crowd on the hill. 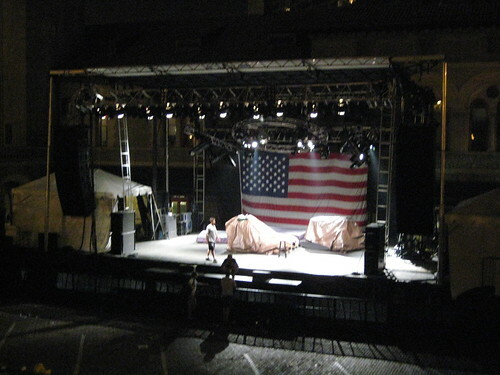 The sound company provided two sets of “hill fill” loudspeakers (at 80° outward) so that everyone could hear even if they weren’t directly in front of the stage. Definitely one of the largest open spaces available and combined with the wonderfully breezy weather, a perfect place for an outdoor show. Despite the crush I bumped into Evan and company, Jon, and Rob Rob. Although now I’m not sure why I call him “Rob Rob” since I don’t ever remember knowing another Rob with whom he might get mixed up with. Oh well.